This week in 1984, a song that needs no introduction to anyone old enough to remember the year debuted on the ARIA chart on its way to number 1. Holding on to the number 1 spot this week in 1984 was Nena's "99 Luftballons/99 Red Balloons", which remained on top for a third week. Revamped from the understated piano and vocal album version for its single release, this might have been criminally overlooked in Australia but remains Paul Weller's career-best effort in the US. After non-movie single "Why Me? ", Irene Cara was back in soundtrack mode with this latest Giorgio Moroder collab, taken from comedy film D.C. Cab, starring Mr T and Gary Busey. Here's one of those random country tracks that slipped into the top 100 without most people realising. 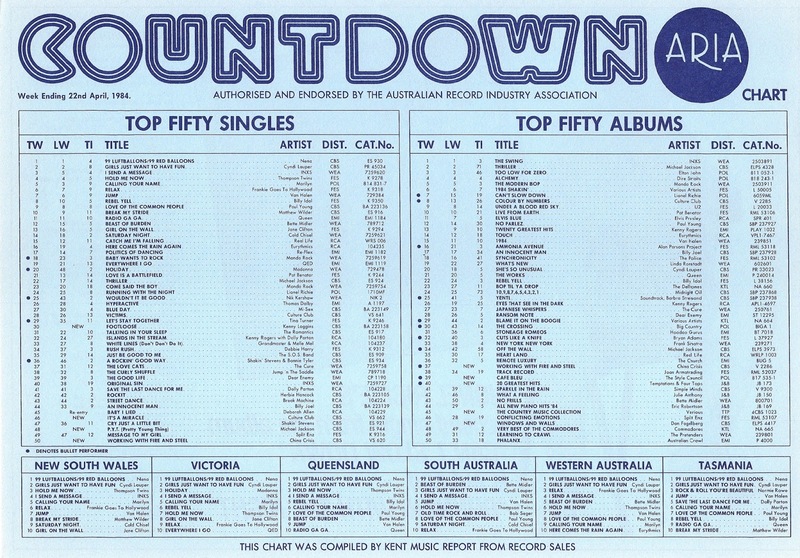 This was MMM's final Australian chart appearance - his biggest hit having been "Wildfire" (number 22 in 1975). So close yet so far! This debut single by the Scottish new wave band really should've done better locally. The UK number 6 hit was covered almost two decades later by Dario G.
We saw follow-up single "Wishful Thinking" enter the top 100 last week and finally the (kind of) title track of China Crisis's second album edged into the top 50 after climbing the chart since mid-March. "Working With Fire And Steel" would get stuck on the bottom rung for two more weeks before finally mustering enough momentum to reach its final peak - not a massive hit, but a song that seems to have a fond place in many synthpop fans' hearts. I'm pretty sure there's an anti-Thatcher message in the lyrics. While "Thriller" had brought proceedings to an end for the album of the same name in most parts of the world, Australia went back and mopped up the single we'd skipped over. Thriller's sixth single, "P.Y.T. (Pretty Young Thing)", became the final release here and brought the album's tally of Australian top 40 hits up to six, with only "Human Nature" having missed out. Co-written by Quincy Jones and James Ingram using the title from a different song Michael Jackson had co-written, the much-sampled funk track had been a top 10 hit in the US, but probably did as well as it was going to at this stage in Australia - especially without a music video. It's still staggering how tight-fisted Epic Records were, considering how much money Thriller would've made them, to not OK a clip for this song. How amazing would it have been, especially if guest vocalists Janet and La Toya Jackson put in an appearance? Speaking of music videos, I have vivid memories of this clip - the Monopoly board, the geisha girl playing guitar, Jon Moss's crop top, the premature career flashbacks... At this point, though, Culture Club could pretty much do whatever they wanted and no one would mind since they were releasing one great single after another. And there was no more perfect way to follow dramatic ballad "Victims" than with the bouncy, Caribbean-influenced "It's A Miracle", which became the band's sixth consecutive top 20 hit. As it wrapped up three weeks on top of the US chart, Australia kicked off the Sunday shoes and got dancing to one of the year's biggest soundtrack hits. 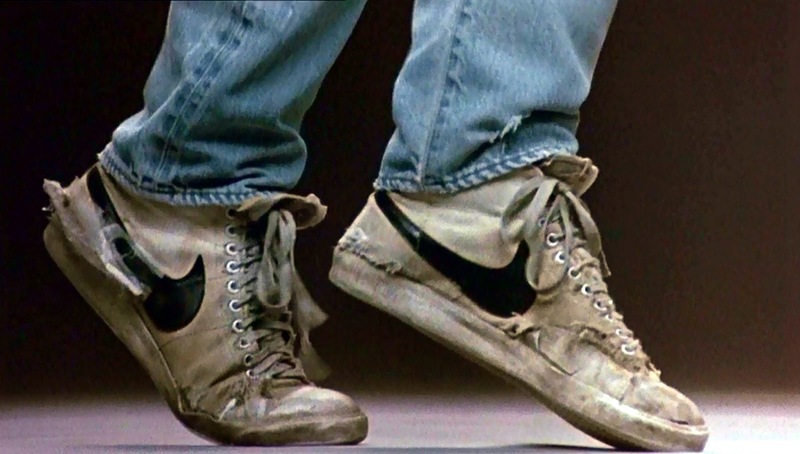 Taken from the movie of the same name, "Footloose" not only played over the climactic prom scene but would provide the soundtrack from countless weddings, 21st parties and retro club nights for decades to come. The song was co-written by Kenny Loggins with Footloose screenwriter Dean Pitchford, who co-wrote all nine of the tracks on the soundtrack album. Given Kenny's previous (overseas) success with "I'm Alright" from Caddyshack, his involvement with the theme song was crucial for film execs - but it almost didn't happen. Kenny had broken a rib during a show and taken time out to recuperate, leaving only a very small window for the collaboration to happen. Dean fought through his own illness rather than lose the opportunity. 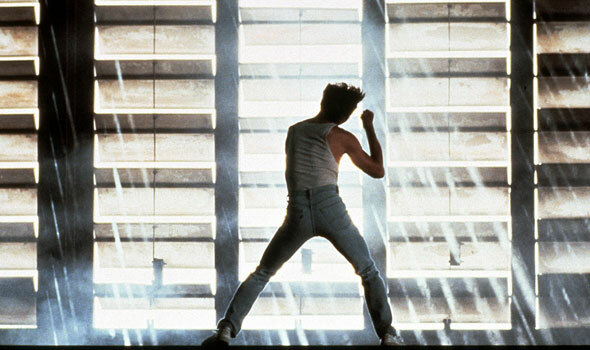 "Footloose" was the first of six top 40 hits from the soundtrack album in the States. In Australia, only two songs from the movie achieved the same level of success - we'll see the second one in early June. Kenny's other US hit from the album, "I'm Free (Heaven Helps The Man)" either went unreleased here or, if it did come out, missed the top 100 entirely. 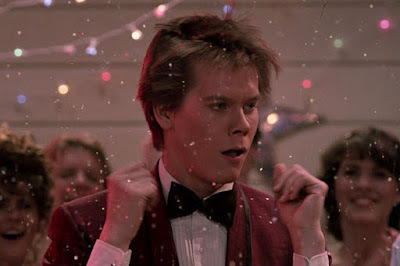 The video below is the one I remember with all the variously shoed feet dancing, while the official Vevo video features more scenes from the movie, especially Kevin Bacon's warehouse dance (which was actually performed to Moving Pictures' "Never" in the film). 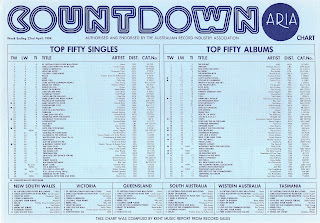 Next week: time for some comedy (oh, good), with all three singles entering the top 50 having a humorous bent - including the record that sneaked to number 1 ahead of "Footloose" and parodied another of this week's debuting artists. I didn't know the Irene Cara, The Style Council or Fiction Factory tracks, but they're all fairly good. I discovered 'Working With Fire and Steel' via a Countdown repeat in 2010. It should have been much bigger. 'P.Y.T.' was a rather ironic song title for Michael Jackson, in light of the allegations that were to come... I wonder if the lack of videos for the 'Thriller' album had something do with all of the stupid genre-specific charts the US has? e.g. sending one track to 'r&b' radio (hence not requiring a video), and another soon after to 'pop' radio or 'mainstream rock' radio for wider appeal (requiring a video for MTV rotation)? 'I'm Free (Heaven Help the Man)' was released here in July 1984 according to the Kent Music Report new release lists. I didn't know it at the time, but how odd it missed the top 100.